Meet our Florida Podiatrists Listen to our doctors and patients discuss the atmosphere of our office and how they treat you like family. 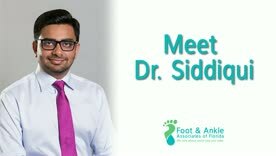 Meet Dr. Siddiqui | Why Podiatry Dr. Sohail Siddiqui shares what led him to the practice of podiatry and some of the most common foot and ankle conditions he treats! Meet Dr. Fussell | What I Enjoy About Our Practice Dr. Tara Fussell of Foot and Ankle Associates of Florida shares a bit about what she loves about our practice, and more!